Join Henry curators and practitioners from an array of disciplines as they share their perspectives and expand upon core ideas in exhibitions. Associate curator Nina Bozicnik is joined by Stevi Costa, writer and performer, Alyza DelPan-Monley, dancer and choreographer, and Naomi Hume, art historian, for a conversation that thinks with and through the exhibition Martha Friedman: Castoffs. 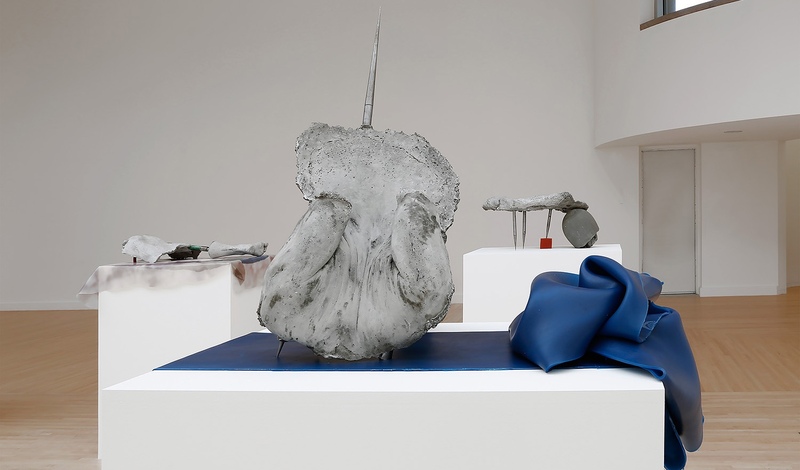 This conversation will take place in the gallery surrounded by Friedman’s hybrid sculptures that combine concrete cast body parts with metal spikes and armatures, as well as tubing and sheeting made of rubber. The dialogue will explore topics including the body as an object of sculptural inquiry, gendered representation, and the social and cultural conditions shaping embodied experience. Stevi Costa earned her PhD in English from the University of Washington in 2016. She specializes in 19th and 20th century American literature through the lenses of feminism, queer theory, and disability studies. Her work articulates theories of embodiment across narratives of bodily difference in both the literary and performing arts, and combines disciplinary approaches from literary theory, cultural studies, and performance studies. A performer herself, Costa is interested in finding the intersections of theory, practice, and the material body on the stage and on the page. She is currently an Instructor in Humanities & Sciences at Cornish College of the Arts. Alyza DelPan-Monley is a Seattle-based dancer and choreographer, seeking to brighten her surroundings with splashes of whimsy, human connection and goofy possibilities. Her work has been performed Seattle International Dance Festival, Cafe Nordo, Annex Theater, Book-it Repertory, Washington Ensemble Theater, Evoke Productions and Strawberry Theater Workshop. She loves dancing in every context and is always excited to find the unexpected places dance can show up or the synthesis that happens when you begin with dance as your access point. Known for her quirky non-sensical non-sequiturs and character-ridden theatrics, Alyza believes that dance can burst bubbles and repurpose awkward into awesome. Naomi Hume is an associate Professor of Art History at Seattle University. She teaches courses on modern and avant-garde art in Europe and specializes in the history of modern art in Central and Eastern Europe, particularly that of the late-nineteenth and early-twentieth centuries. Her research and teaching interests include the representation of gender, nationality and politics in visual art and popular media and in particular, how artists adapt visual vocabularies to respond to new political, social and cultural contexts. Her current research focuses on the performance of gender in 19th-century art and contemporary media. $10 General Admission; $6 Seniors (62+); Free for Henry Members, Students, and UW Faculty & Staff. Program ticket includes museum admission. Pre-registration is encouraged.